Are you ready for a quick, 5 minute Halloween decoration? 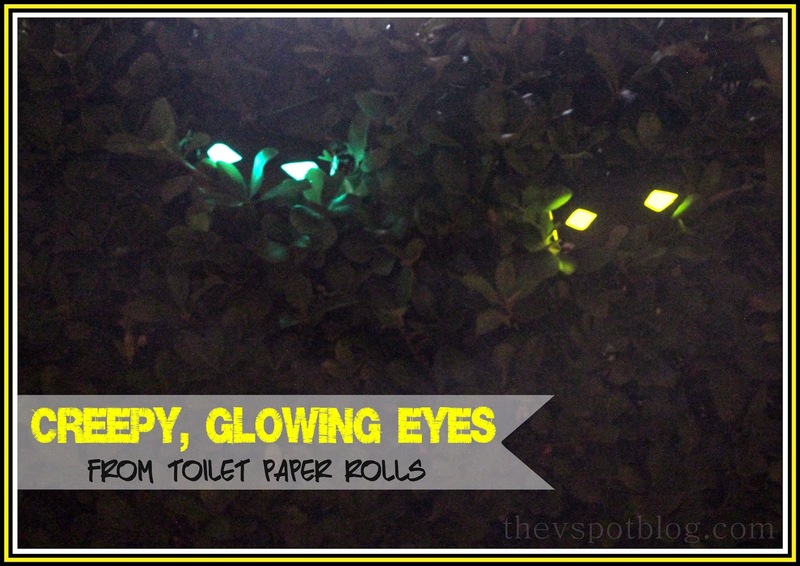 How about some creepy glowing eyes made from toilet paper rolls? Seriously as easy as pie. Press the roll flat, take scissors and cut two holes in it to create the eyes. It doesn’t have to be perfect or symmetrical. These are crazed beasts. It is not unimaginable to think they might have wonky eyes. Cover one end of the tube with tape and then take it outside and give it a light coat of the black spray paint. Again, doesn’t have to be perfect (or all the way around, for that matter.) You just want it to better blend into the bushes (or wherever) you put your glowing eyes. Leaving it the plain brown paper roll doesn’t camouflage it all that well. Crack open a glow stick, place it inside the roll and then cover the open end with tape. (Or even pinch it and staple the end shut… just depends on the shape of your eyes.) Happy haunting! Scary in a very cool and creative way! Super cute, super easy DIY Halloween decor with American Crafts kits.